In this guide, we are going to delve into the mysteries that surround the most iconic figure in your army, the bastion of strength and the inspiration to your forces at large. In this guide, we are going to discuss your Hero. The Hero leads your troops on military marches. Even alone, they are able to destroy an Invader who has entered the Kingdom and strike terror into the hearts of enemies. 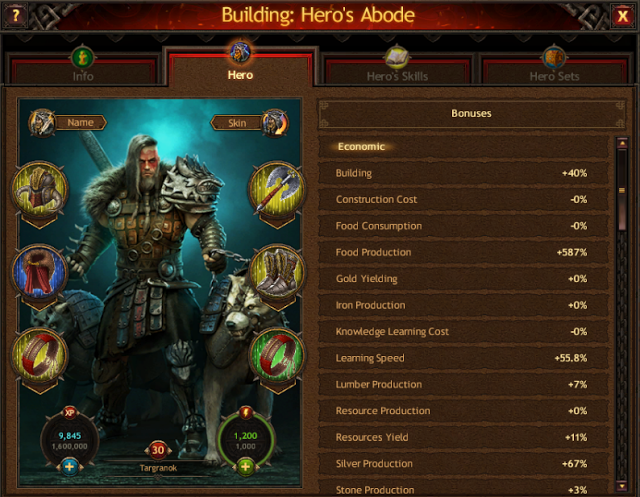 Both the Hero’s equipment and the Hero’s Skills grant additional bonuses to various important parameters that directly affect the stats of troops led by the Hero and the economic stats of the Town. You can always find the Hero in the Hero’s Abode. Here you can change their name and appearance with the use of special items, by clicking the Name or Skin icons respectively. Please note: these actions don’t grant any additional advantages and only reflect your personal preferences. In the Hero’s Abode, there are also slots where the Hero’s equipment crafted in the Forge is placed. Choosing the right Hero’s equipment is very important for enhancing the parameters that determine your army’s success and your Town’s prosperity. 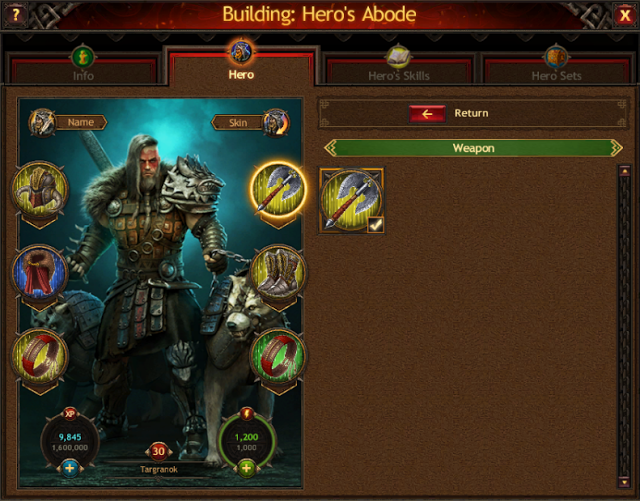 Each piece of equipment grants certain bonuses, thus allowing you to develop various strategies. For example, some Jarls prefer equipment which increases resource production, while others make use of armor that strengthens their army. 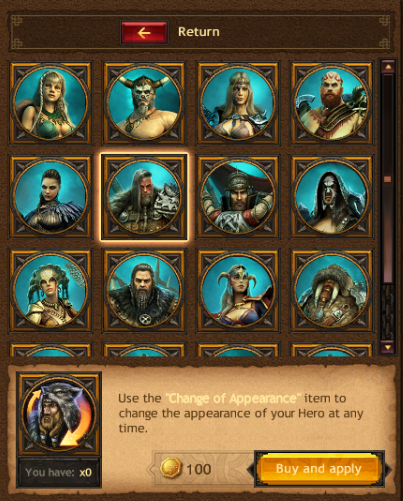 You can change the equipment that is currently equipped on the Hero by clicking on the corresponding slot. 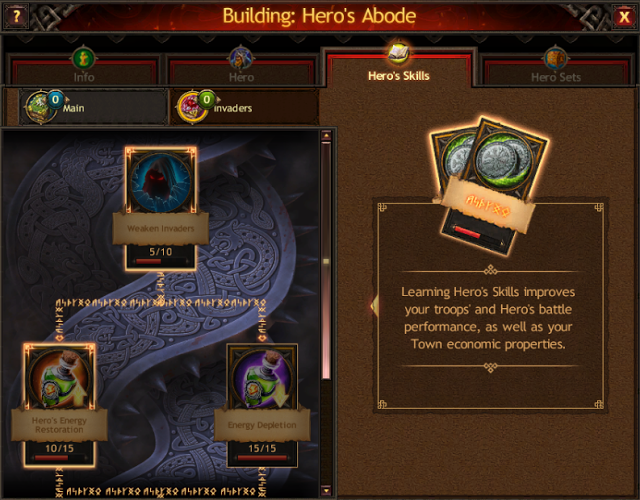 By increasing your Hero’s level, you get the chance to upgrade their Skills. These increase the combat ability of troops led by the Hero and resource production in the Town, and also positively affect other important processes in the game. To reach a new level, you need Hero’s experience, which is gained by attacking Invaders, destroying enemy troops, and completing Tasks and Quests. Upgrading Hero’s Skills doesn’t require resources or Gold and is performed instantly. As you can see in the screenshot, there are two types of Skills. 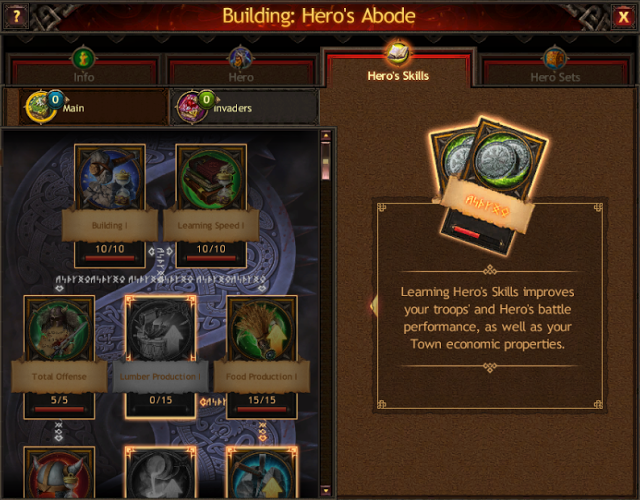 The Main tab contains Skills you can use to improve your troop characteristics and various processes in the Town. By wisely combining them with Hero’s equipment bonuses, you will acquire great power and mightiness. The second tab contains the Skills required for fighting Invaders. These allow you to attack Invaders more effectively and with lower energy cost and to obtain rare materials, gems and much more. Finally, the Hero is the main figure of your army. If you want to achieve success in the Viking world, you should pay attention to developing your Hero, their equipment and Skills. Play Vikings: War of Clans NOW!